Here's a superb new online slots game from Yggdrasil gaming that you can play. Loved by young and old, the Jungle Book by Rudyard Kipling is a favourite around the world. The animals in these stories have taught moral lessons to readers for generations. Captivating tales about Mowgli a human boy and the lovable characters he meets in the jungle, including Baloo the bear, Shere Khan the tiger and other cool characters. Check out our entire list of online slots games at SlotsBaby now. 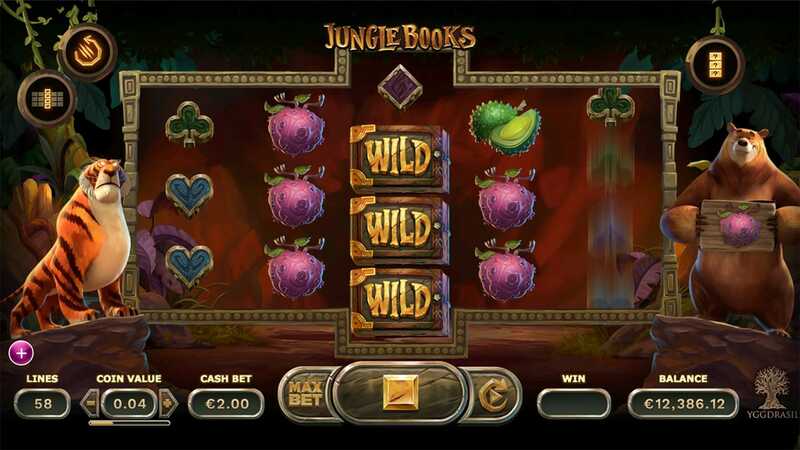 These classic tales have now been transformed into Jungle Books, an action-packed slot machine from Yggdrasil with 5 reels, 58-68 paylines and is playable from 10p to £250 per spin. The game is full of adventure and excitement for Mowgli and his animal friends and equally exciting is the brand new engine the machine runs on. Thanks to the Fusion Realms mechanic there is a continually evolving set of reels for players to move through making this a truly unique slots experience. Multi-award-winning Yggdrasil Gaming have emerged as one of the industry’s most respected and acclaimed providers, making casino games for some of the world’s biggest operators. From colourful online slots Pumpkin Smash and Rainbow Ryan to 1960’s style Reptoids and laid back Spina Colada Yggdrasil are new kids on the block making a big impact on the industry. Get set to experience a revolutionary online slot! Jungle Books uses Future Realms technology that mixes lots of reels and exciting features into a single game and is built in HTML5 so available for all your desktop, tablet, and smartphone devices. 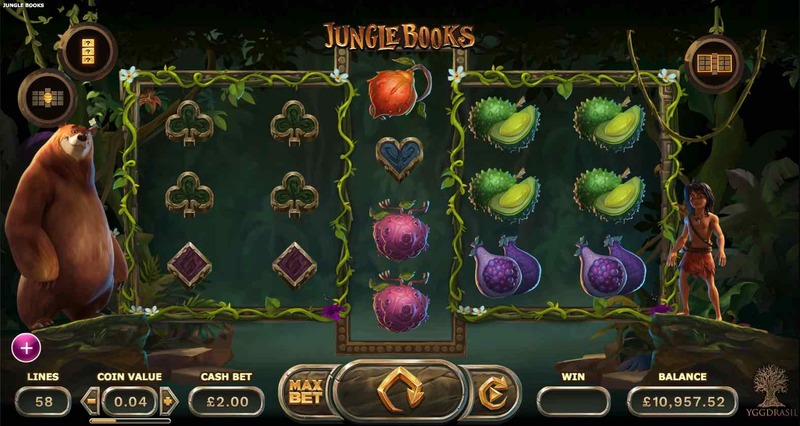 Jungle Books has an amazing 45 feature combinations that you can explore as the 5 characters journey through the jungle. Each character has individual features and reel sets to use along the way. Rulers of their own realm, the characters can also guest star in other realms, meaning the fun feature never stop. A very impressive feature of the Fusion Realms technology is the capacity for the size and the shape of the reels to change during the game. This means you might see Mowgli on one side of the reel and Baloo on the other side at different times, each bringing their own unique special feature. So players will have a thrilling ever-changing board that will keep the entertainment high and the combinations appearing like never before. The graphics and artwork are spot on, and the game is a joy to play. As with all Yggdrasil high-end offerings, there are smooth and charming animations and excellent gameplay. Despite the wide range of features the simple structure and easy gameplay make this online slot straightforward to determine paytables, symbol values, WILDS, and SCATTERS. Wild Superhigh symbols: All Superhigh pay symbols turn into wilds. Win Multiplier: Random wins receive a x2, x3 or x5 multiplier. This is added to the entire spin including any Honey Comb symbols. Stacked symbols: With each spin 1 random symbol becomes stacked on all the reels. You can choose any symbol, including the wild symbol and honeycomb symbol. The Honey Comb: A honeycomb symbol is added to the tallest reals. Get one or more of these and you get a Pick and Click mini-game and can pick one prize for each honeycomb – ranging from 50 – 50 000 coins. X3 Wild Multiplier: A win with at least 1 wild I the payline gets a x3 multiplier. Win Both Ways: All lines pay from the right and left – and 5 of a kind wins pay twice. Sticky Respins: Landing any win triggers a respin with those symbols along with all wilds as sticky. Synced Reels: Reels that are synced together always give the same result. In the Boy, Tiger and Bear’s Realm – Reel1 and Reel2 are synced and Reel5 and Reel5 are synced separately. In the Panther’s Realm – Reel1 and Reel5 are synced. In the Snake’s Realm – Reel2, Reel3 and Reel4 are synced.